In just a few weeks (March 13th) Comic Relief will ask people to pick their nose (!) or paint their face to raise money for charitable causes in the UK and abroad. 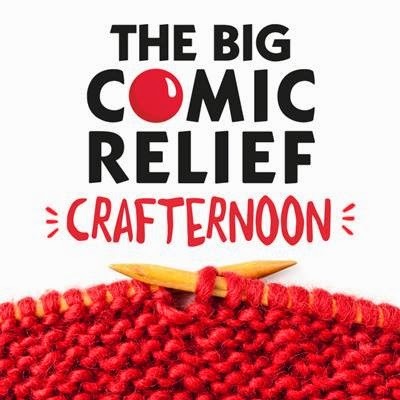 Crafters are also being invited to raise money by hosting a Big Comic Relief Crafternoon (craft fair). To give ideas and inspiration, a selection of well known crafters including Tif Fussell, Lucy from Attic24, Jodie Carleton, Mr X Stitch and my Mum (!) were invited to submit patterns for a very special edition of Mollie Makes. If you've been a Mollie Makes subscriber from the start (as I have) you'll recognise many of the 50 different patterns which are presented here, along with the brand new contributions which include: knitted beards, crochet red noses, DIY craft themed dinner plates, messenger bags made from vintage pillowcases and wristwarmers and.... my mum's knickers!! Also included is a guide to running your own craft fair - you can make an entire troupe of felt guinea pigs/nursery full of Spring posy brooches/forest of moustaches and sell them to make more crafty cash for Comic Relief. The magazine is available from Sainsbury's from today and digital versions can be purchased via iTunes and Google Play. The cover price is £7.99 with a full £5 going directly to the charity. What are you waiting for?! I may be forced to take a trip to Sainsbury's this afternoon! I love seeing all the sewing bee contestants again on last weeks 2014 catch up, I was fb messaging my daughter whilst we watching it together but in separate parts of the country! We both wrote at the same time "I'd forgotten how lovely Lynda is!"